OK the sprouts soaked over night and This morning I rinsed them 3 times leaving the jar tilted with the screen side down still allowing air circulation. I should mention I am using a fine screen right now that allows the water to drain without all the seeds leaving the jar and going down the drain. 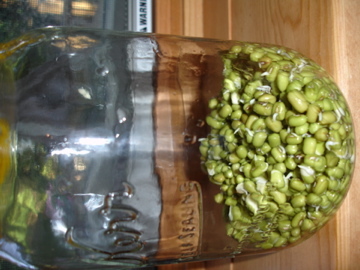 As you can see in the photo the seeds have begun to sprout already. I will rinse at least 2 to 3 times a day. By request less post, more photo. This entry was posted in Sprouts on August 2, 2011 by Kim Galizio. Thank you Kim, the sprouts look good! Kim, maybe I’m just a big dork, but I’ve enjoyed learning about the sprouts. I’ve never known anyone to grow their own, and I have personally only bought them in plastic containers at the grocery store. So it’s interesting to see the process. That was for the benefit of Carolyn who felt I got a little long winded in the first post with a little tiny picture. My thoughts were to do this day by day. So day 3 will be up. We should have some extras from this batch for you.